For historical reasons, we like to know about all MGB’s, whether they are owned by members or not, so anyone is welcome to send in their car details. If you are not already a member of the MG Car Club then please consider joining, see the MG Car Club website for details. This information will be added to our database. Even if your car is already scrapped or sold your information will be useful. Your data will be strictly confidential and will only be distributed to those Committee members with a need to know. Pictures of registered members’ cars can be seen on our photo gallery – click here. 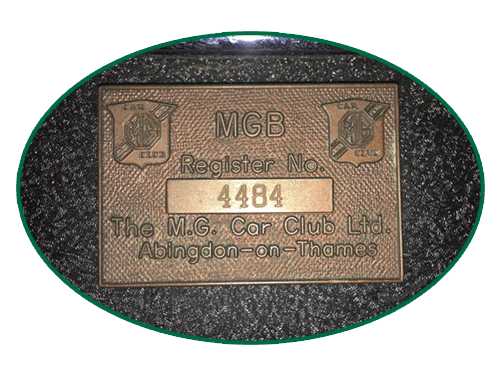 Inscribed with your MGB Register number are available to MG Car Club members for only £10.00. Contact the Registrar for details. Please note that any information you provide will be used only to help update the MGB register. We may contact you occasionally about MGB register matters. No details will be shared without your consent. On successful submission you will be taken to a success page, if this does not happen please scroll down the page as you may have not completed the form correctly.